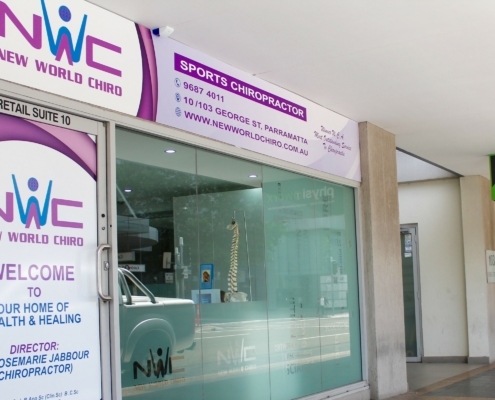 Welcome to New World Chiro – your professional and trusted chiropractic clinic located in Parramatta. You can find our clinic at 10/103 George St Parramatta (easily accessible by residents from Westmead to Oatlands, North Parramatta, South Parramatta and more). Dr Rosemarie Jabbour (Chiropractor) and her team have been providing chiropractic care, and their best service, to the local community for over 20 years. We hope we can help you! If you’re a new patient looking to start chiropractic at New World Chiro, this information is for you. Let us help you to better manage pain, improve posture and feel better. Get started by meeting with Dr. Rosemarie Jabbour (Chiropractor) to discuss your case. You’ll receive a full Report of Findings and learn what you may achieve with chiropractic care (x2 first visits only $89). We offer you comprehensive reporting and diagnostic services together with our commitment to work with you on addressing some of your health concerns. Chiropractic commonly helps neck pain, back pain, headaches and migraines. We may be able to help you with muscular aches and pains, nutrition and detox assessments, sports injuries, as well as spinal and nervous system issues. Find out how chiropractic may help you and have a look at the different health conditions we commonly help with. Dr Rosemarie (Chiropractor) was awarded ‘Most Outstanding Service to Chiropractic’ in 2004. Dr Rosemarie (Chiropractor) has over 20 years of experience including Olympic Team Chiropractor. If you’re looking for a chiropractor in Parramatta, she can help. Chiropractic is an effective and natural way to manage musculoskeletal pain and may correct many of the ailments we suffer in modern life. Read on to learn if your health issue can be helped. There are many paths to feeling better, let’s find the one that best suits you. Your organisation can benefit from our health and chiropractic assessments. We cover office ergonomics, posture and ways to boost productivity. We also run regular community health and wellness workshops here in Parramatta. Check our schedule for your next workshop, and feel free to bring a friend! New World Chiro is conveniently located in the heart of Parramatta at 10/103 George St. Close to bus stops, Parramatta train station and other amenities. There is also paid street parking available right out front of the Parramatta chiropractic clinic. Areas of Service: We proudly serve the Parramatta and Western Sydney Areas. Our patients commonly come from Westmead, Oatlands, North Parramatta, Rydalmere, Harris Park, Rosehill, Holroyd, Merrylands and surrounds. Allied Health Referrals: We accept some medicare service charges, most health funds, Allied Health referrals (you can request these from your local GP), Department of Veterans’ Affairs patients, students, concessions and seniors. Call us in Parramatta today.